Look 1: PREPPY – Supre crop, thrifted pleated mini skirt, Merona cardigan, vintage coach backpack, Windsor Smith platform loafers, beret from eBay, K-Mart knee-high opaque tights, Adidas Originals watch. This look is definitely inspired by Clueless vibes and that pared-back 90s minimal style, focusing on a simple colour palette. I’d even wear little black bike shorts under this mini skirt for extra freedom of movement. And no – I don’t expect you to fit all your school supplies in a bag that tiny lol. I just could not effectively fit the intended bag in the frame for this look, but it would have been my Candy Sugar japanese school bag. 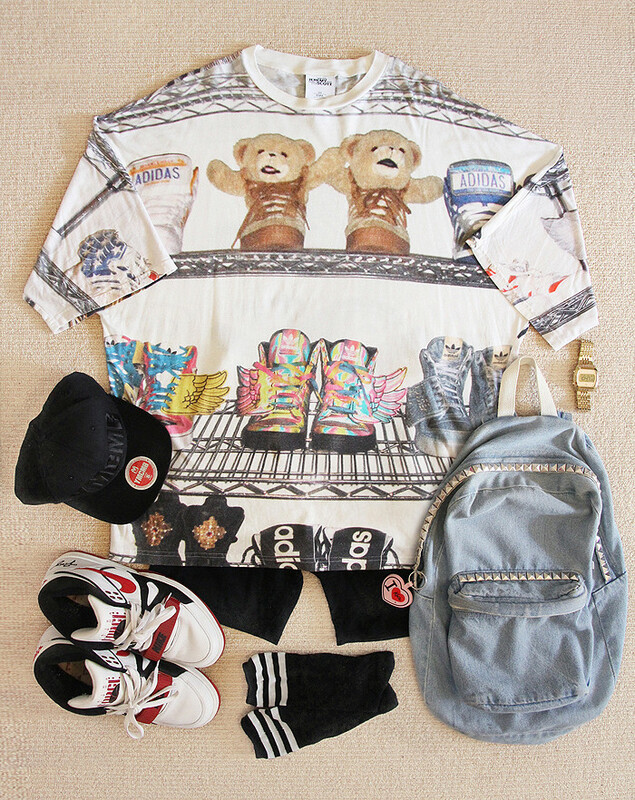 Look 2: SPORTY – Jeremy Scott x Adidas Originals oversized t-shirt, American Apparel denim backpack (customised with studs and Katie keyring), Nike sneakers, YMCMB official snapback, Adidas Originals watch, bike shorts from eBay, socks from somewhere in Shibuya. This is actually my go-to travel, school, movies, running-erands, quick-and-easy look. The t-shirt is insanely soft and has a really flattering fit despite how big it is! This is such a suitable look for class, and the denim AA backpack is super sturdy and great for carrying a laptop and books. Look 3: CUTE – Topshop polka-dot dress, Supre crop, pastel backpack from SPINNS, Nike AF1 sneakers, Adidas Originals watch, crescent moon choker from Etsy. A classmate of mine once told me I looked like an ice-skater when I wore this. The skirt of the minidress definitely has that vibe. Super-short and/or thin-strapped dresses are much easier to wear if you layer it over some bike shorts and a fitted t-shirt. And I can guarantee the comfort of this look as I wore it on the hike up to Diamond Head Summit in Honolulu.